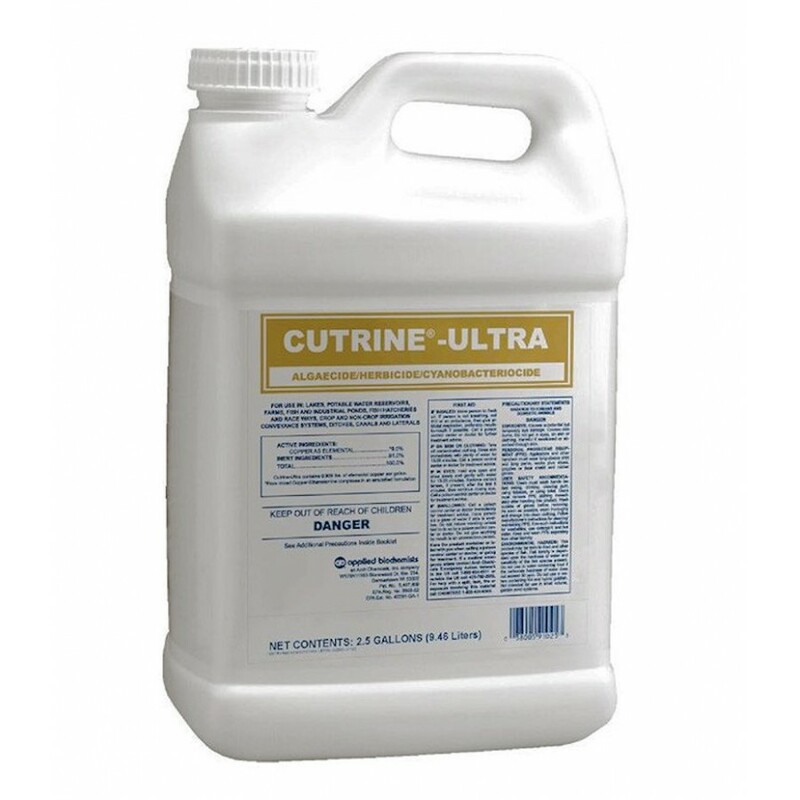 Cutrine Ultra under field conditions, is effective in controlling a broad range of algae including Chara, Spirogyra, Cladophora, Vaucheria, Ulothrix, Microcystis, and Oscillatoria. Effective in hard water. Cutrine-Plus Ultra is an improved formula of the standard 9% double chelated Cutrine-Plus product through the addition of an emulsified surfactant. This gives Cutrine-Plus Ultra greater control over resistant forms of algae such as Hydrodictyon and Oscillatoria. 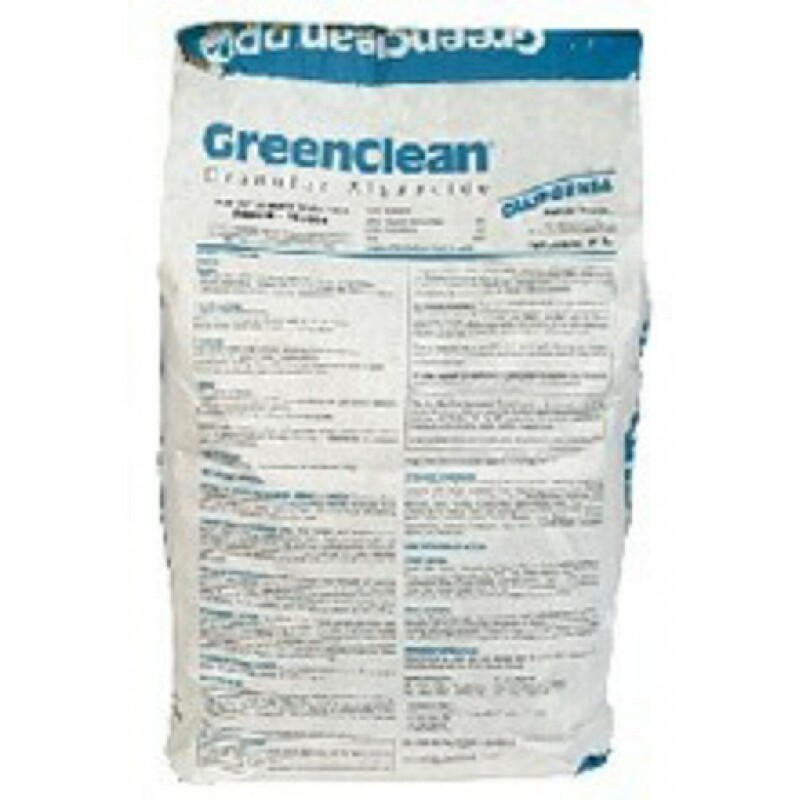 9% chelated copper algaecide for use in lakes, potable water reservoirs, farm ponds, fish and industrial ponds, fish hatcheries and raceways, crop and non-crop irrigation conveyance systems, ditches, canals, and laterals. Application rate from 0.6 to 3.0 gallons per acre foot of water treated. Apply Cutrine Plus Ultra early in the day under calm, sunny conditions when water temperatures are at least 60 degrees - For best results dilute and apply by sprayer. There is no need to add a Surfactant/Activator, it is already mixed in with this liquid. Treated water may be used for swimming, fishing, drinking, livestock watering, or irrigation immediately after treatment. Far less corrosive and more stable than similar common algaecides. Water hardness will not reduce effectiveness. Begins to work on contact with algae. Once contact is established, CUTRINE-PLUS Liquid begins to work immediately to break down the algaes cellular structure and interrupt the ability to photosynthesize food. Controls Planktonic Algae in 24 to 48 hours, Filamentous Algae in 3 to 4 days. 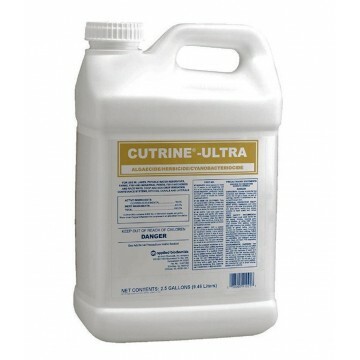 Use CUTRINE-PLUS Liquid to easily control surface algae or algae growing within 3 feet of the surface. Begin application in spring as water temperature warms to 60º F and above. Early treatment when growth first appears or begins to create a nuisance will reduce the amount of CUTRINE-PLUS Liquid you will need. Early treatment will also reduce the amount of dead growth. Pond water Clean and Clear! Control will last for several weeks to several months depending on local conditions. Several applications will usually be required to maintain season long control. Retreat as re-growth begins to appear. Allow 1 to 2 weeks between consecutive treatments. Heavy, out of control growth may require more than one application or physical removal to gain control. For best results, use under conditions of minimal water flow. Apply early on the morning of a calm, sunny day. Contact time should be at least 3 hours. CUTRINE-PLUS ULTRA Liquid may be toxic to Trout if carbonate hardness of treated water is less than 50 ppm. Most surface waters exceed this limit and pose no threat. If in doubt, use the Water Hardness Test Strips. Do not use in water containing Koi or hybrid Goldfish. To apply, determine the volume of water to be treated in acre-feet. Use 1 gallon of CUTRINE-PLUS ULTRA Liquid per 1.5 acre-feet of water. Dilute with a minimum of 9 parts water. Spray uniformly over the water surface with a Sprayer. Allow material to rain down in coarse droplets for better surface penetration. Contact with algae will be improved by breaking apart heavy surface mats before application. Treat heavy infestations in sections to avoid oxygen depletion.